Walter Harrison’s Suet Rolls provide a high-energy boost of nutrition in a choice of 3 delicious flavours: wild berry, seed & insect, and mealworms. 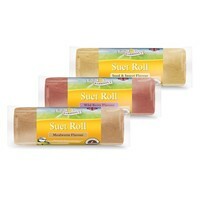 Packed with energy and essential oils, Suet Rolls are 100% edible (meaning no waste and no mess) and can be fed all year round. They are particularly beneficial during the Winter and Spring months when natural food is scarce.